Thomas Hampson delivers a riveting portrayal of the multifaceted title character in Verdi’s masterful Shakespeare adaptation. Haunted by a prophecy that proclaims him King of Scotland, Macbeth doesn’t rest until his quest for power leads him to madness and death. 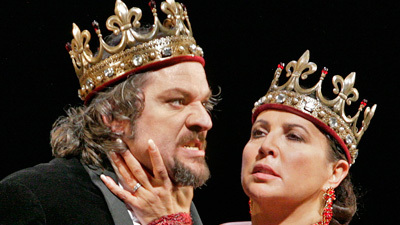 Nadja Michael is Lady Macbeth, whose boundless ambition accelerates their downfall. Günther Groissböck brings style and gravitas to the role of Banquo, whose murder sets off Macbeth’s final unraveling, Dimitri Pittas is Macduff, and Gianandrea Noseda conducts.